I’ve written it on this blog before, and it’s still true, Die Burger is one of my favourite rides of the year. It’s a ride I look forward to immensely, and it has never failed to live up to expectations. The anticipation this year though came with a large dose of reality. I knew from the outset it was going to be a very different ride to last year. At 5km longer, and without the DC-conditioned legs or the strong tail wind chasing us home, it was clearly going to be a significantly slower ride. All of the these were looking to have some added help by virtue of starting with several Wannabee team mates. Around 6 or 7 of us all line up in the chute together, huddling against the cold wind in the dark of the morning. But we were down to just 3 by the time Helshoogte had done it’s worst, and strong blasts of head-on South Easter had shredded us on the stretch after towards Franschhoek. Hendrik, Ron and myself then passed each repeatedly down the super fast section towards Paarl – the wind now at our backs, were holding speeds of 45 to 50km/h without really digging into the red zone. Swinging right off the R301 and into the vineyards, brought up the biggest of the above tests – not getting dropped. And here, riding with Hendrik and Ron really helped. We not only stayed together, but were in the front third of our bunch, at times taking our turns working at the front. What a transformation from the last couple of years. Despite blasting along to this point, the legs had plenty left in them. There was an added reward at the end of my nemesis loop through the vineyards too – I’d broken the jinx, and now we were being treated to a new route. 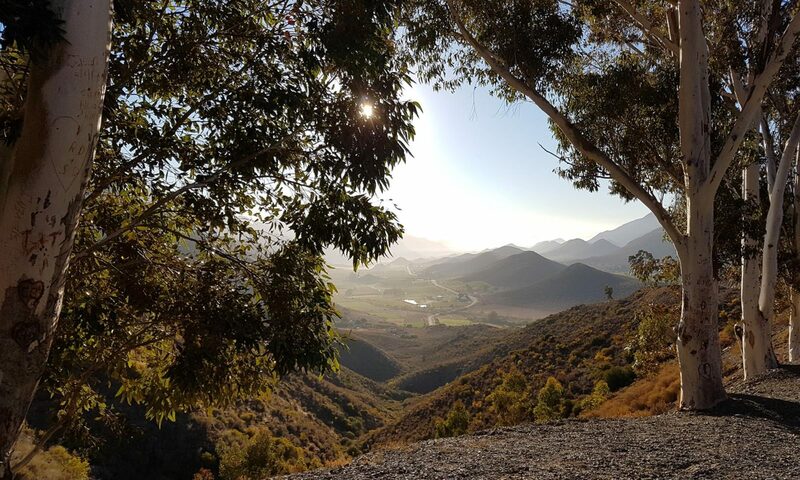 Rather than heading into the outskirts of Paarl, we swung right and the leg into Wellington was through glorious rolling farmland and on freshly resurfaced smooth tar too. Heavenly! The wind had been blustery and troubling so far, but rolling back onto the familiar route just before Wellington it became a real factor. Climbing up over Windmeul on the R44, I slowly slipped back and detached from both Ron and Hendrik. I wasn’t struggling especially, but with the rolling hills and wind I needed to fall back to a sustainable pace for the remaining 45km. The fresh road surface this time was less of a help. Rather than rolled smooth, it was rough and sticky and full of large stone chips. My average speed dropped steadily, but even with the wind and the rough road, I was managing to keep in the 25 to 30km/h region for long stretches. It was all fine, I was having fun. The cramps were never far away over the final 20km or so, but with a careful choice of gearing combination and cadence I kept them away and finished just a shade over 3:30. Seemed like most friends I spoke too had been 20 or 30 minutes slower than the previous year, so even with limited training, it wasn’t a terrible time. Most importantly though, I’d achieved every one of the goals I’d started with. A perfect rehab ride.